Past darkness is appropriately titled, as the story is in no way light and fluffy. Gabrielle loses her parents as a teen and the novel is about how she deals with her grief over the coming years. She ends up on the Dakota plains, finding a connection with horses, but less and less of one with people. It is a touching tale of loss, grief, and coming out of the pain. The author is a beautiful storyteller, weaving words together in such a way that it pulls you in. The descriptions of Gabrielle's surroundings are so vivid, you feel you are right there with her. I enjoyed the book very much overall, but the pacing was very slow.This is a pet peeve for me, as a book has to move along to hold my interest. I did finish it though and very much enjoyed the story. 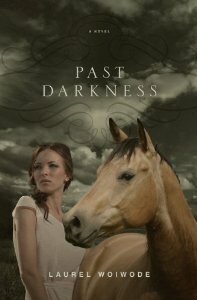 Any fan of young adult fiction would likely enjoy Past Darkness. I received a free copy of the novel in exchange for an honest review. All opinions are my own.